Today was a day of intermittent sunshine and beautiful clouds. 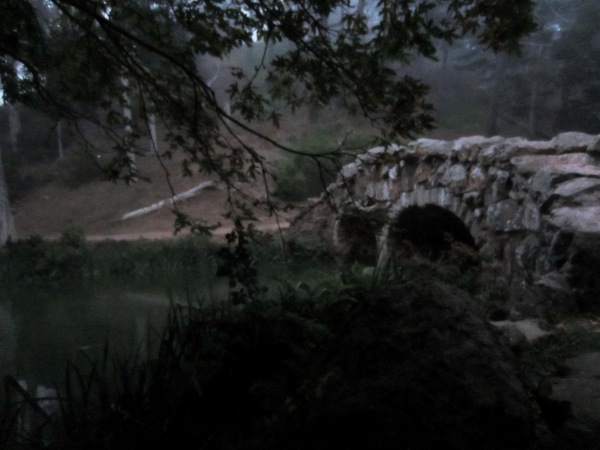 In the evening, a misty fog blew in and Stow Lake looked like something out of a romantic historical film. You half expected to see a lady on a white horse, or an armor-clad knight. By the time we got there, most of the crowds had left. Only a few late walkers like us wandered around the lake. The last boat of the evening paddled toward the jetty. The mallards, geese and Muscovy ducks circled the edges of the lake hopefully before the last visitors disappeared. A gull near the Boathouse hopped down to the edge of lake and came up with – something. It was reddish and scrawny and didn’t look like a piece of sandwich or candy. It brought its catch ashore to deal with it, and I got a closer look. It was a small red crayfish. 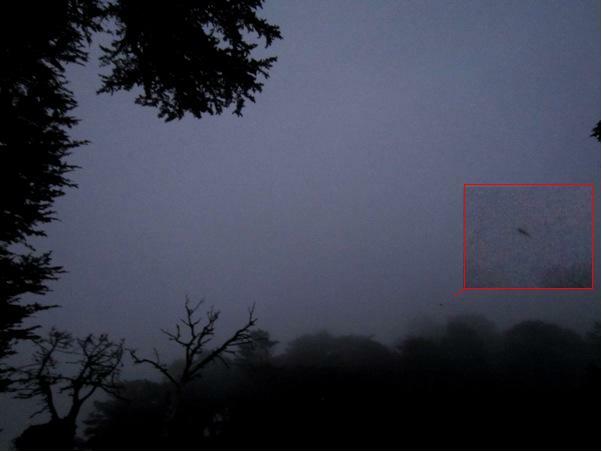 I wouldn’t have recognized it, except that some months ago, I actually saw a much bigger crayfish at Stow Lake. The gull gobbled it down before I could even whip out my camera. A flight of birds passed overhead, looking somewhat like swans and calling to each other. 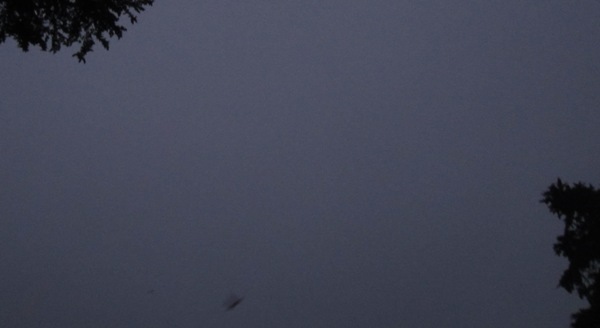 Then I realized it was actually Canada Geese, bleached by mist and twilight. They swept around and landed on the lake. From Strawberry Hill, a Great Horned Owl called softly It sounded tentative, almost thoughtful. Probably just waking up and wanted its coffee. On the other side of the lake, we noticed some black-and-white critters contrasting with the broad yellowish bare path on Strawberry Hill. Though the light was now quite poor, I looked carefully and realized it was a Mama Skunk with two kittens, hurrying along the path and occasionally detouring off it. Then I saw a bushy tail on our side, but it quickly hid amid the rocks at the lake-edge. It may be in the picture below – or not. 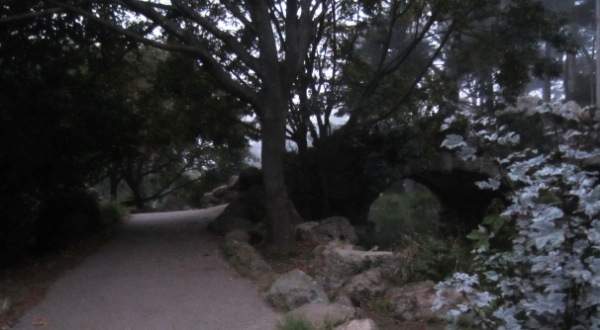 We passed the old stone bridge, and then, on cue at 7.55 p.m, I saw a bat, followed soon by several others. I tried for a photograph, but as usual, got only some smudges. (My technique is to point my camera in their general direction and keep clicking madly.) 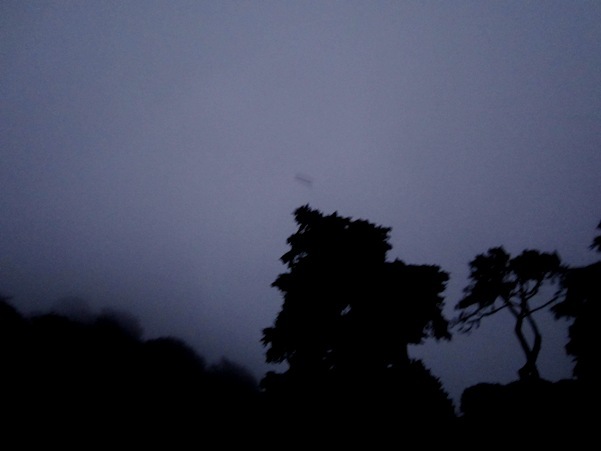 Spot the bats? The geese took off in small flocks, flying away to an unknown destination – maybe the Botanic Garden. It was so quiet I could hear the whistle of the wind in their wings. Further along, the city noises returned – the rush of traffic along the 19th avenue intersecting the park. It was back to our car, and back to the real world. Very nice post. Love Stow Lake, Strawberry Hill and all the critters. What a wonderful post. Makes me feel like I need to wipe the mist from my glasses. Thanks for taking the time to post this. 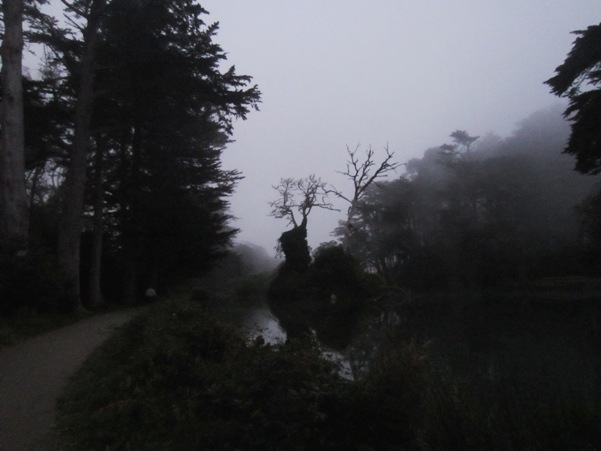 Terrific, moody pictures.